I’m moderating a discussion on the subject of trust and social media at the Web 2.0 Expo in San Francisco this week. 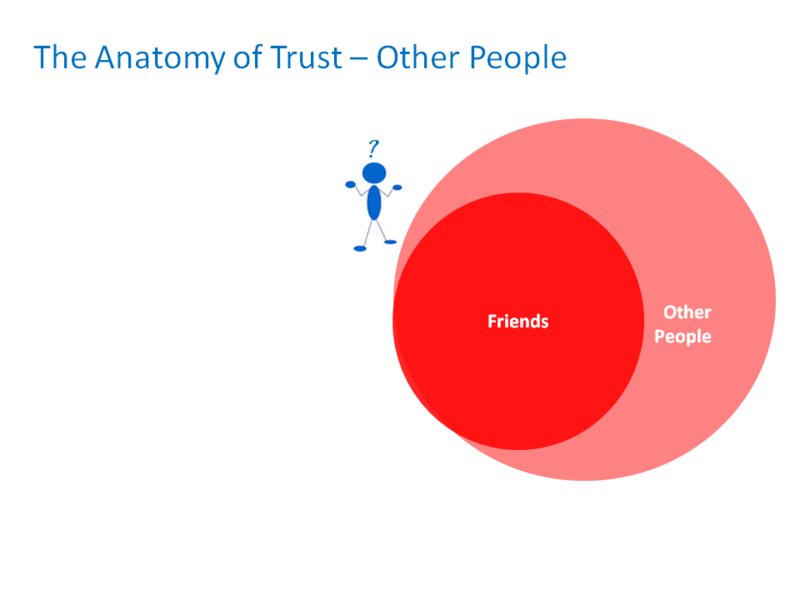 This prompts me to inquire into the anatomy of trust in social media. 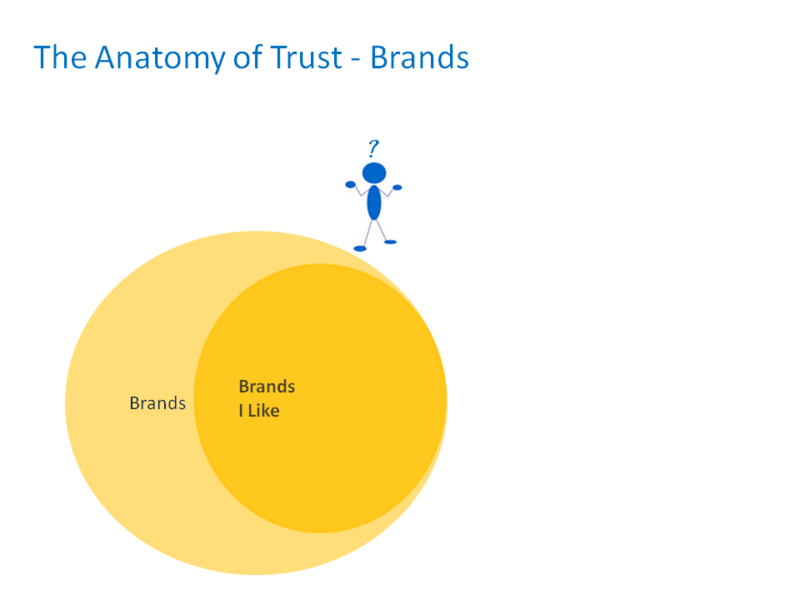 Is social media making trust weaker or stronger? Trust in other people is established on the basis of promises kept. Either explicitly or implicitly we judge that a particular person is reliable, based on our own experiences or those of others. We don’t trust everyone we encounter of course, but a small number of those people we trust and who we happen to like will become friends; especially if the trust and attraction is reciprocated. We have relationships with brands – companies, businesses, service providers and organisations. Today our concept of brand is very stretched, but we understand it to mean the reputation of an organisation (from Coca Cola to the local greengrocer) or person (from Barak Obama to the reliability of the local postman). We choose to use a select number of brands that we trust because they consistently deliver on their promises. I may even actively promote the brands I really like becoming a super-fan or brand-advocate. Talking to my friends about the brands I like is the most powerful marketing tool that exists. We call this “word of mouth” (WOM) marketing when I tell the people who trust my judgement about the brands that I trust. This is the elixir of marketing and yet it is the one aspect of marketing that marketers have had least control over. Social media platforms, Facebook, Twitter, MySpace, Google Buzz and so on, have fundamentally shifted our definition of “friend”. In the past most of us could manage a small handful of people we call a friend. Today each of us had literally hundreds of people we call friend, thanks to social media. For brands this means that the power of word of mouth marketing is exponentially greater. The sphere of influence of the average customer is now much larger than it ever was. When I tell my friends online about a brand, not only are my views visible to them, but very often the conversations are filtered through to their friends, and so on. In this context however our notion of trust is much weaker. I cannot possibly form judgements on the trustworthiness of the hundreds of people I’m friends with online. How do I come to trust these people based purely on their often scant online personas? And yet, more and more I’m relying on them to influence my judgements on a wide range of things. My trust in my online friends is further weakened as I find out that some of them are paid or rewarded for their positivity towards certain brands. As I realise that clever brand managers are increasingly manipulating the “independent” commentary I read online, I start to find it more difficult to trust what I read. In fact, I seek out the negative as the only thing that is trustworthy. Now let’s add the social media organisations themselves into the mix. Let’s remind ourselves that these are for-profit businesses that are mediating human relationships. Their business depends on opening up our personal networks and gathering and revealing as much information about each of us as possible. Do you trust them when they reveal more information to others than you remember giving them permission to do? Or when they are revealing information that you didn’t even realise that they had gathered about you? Do you find it just a bit intrusive when advertisers on their platforms serve you “relevant” and “targeted” ads based on your personal tastes, gender, ethnicity, orientation, date of birth or relationship status? Can you trust a site that allows brands to pay their way to the top of a search you expect to return the “best” results or to allow those brands to filter out the things they don’t want you to hear? Social media is helping us grow our trusted networks beyond our close-knit circle of real-world friends. But how much is that trust worth? Previous Post Social Media = SEO. Right? A fantastic piece and thank you for sharing it. 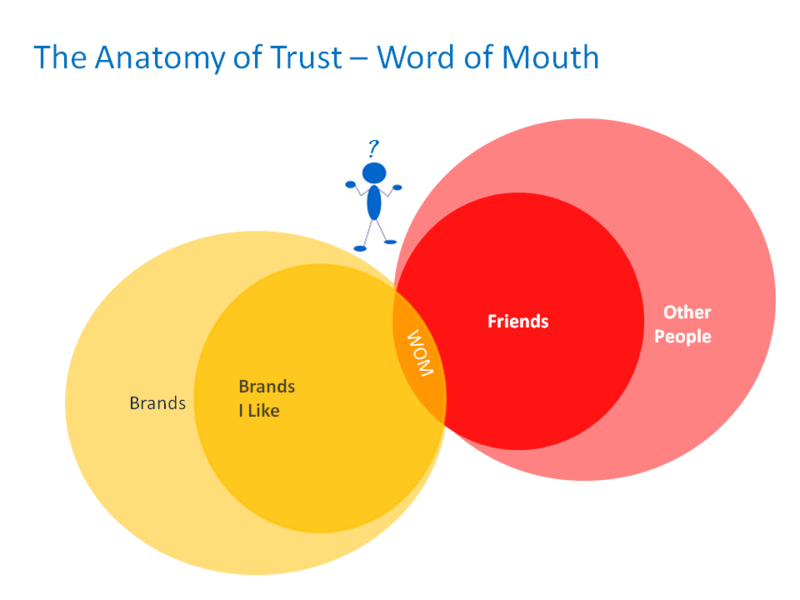 With social media, I think the trust factor works much as you describe trust in friends and brands. The ‘friends’ you make online become more trustworthy as they deliver on their promises. After being online friends with someone you get to see what he/she posts and talks about thus gaining (or not) your trust. Google is paid media and will have a higher commercial drive behind the results it posts. But with twitter it’s mostly everyday people talking about their experiences, so more trustworthy. Therefore I believe social media can be trusted, as long as you are able to filter out the authentic ‘friends’. And that takes time. Thanks for the comments. They suggest that there is indeed no easy way to establish trust online. Social media helps on one level, and yet on another level we end up going back to a smaller group of trusted friends? I wanted to congratulate you on having this post selected to be part of the Carnival of Trust, hosted this month by Julian Summerhayes. Each month the Carnival highlights the best blog posts dealing with the subject of trust in business, politics and society. We agree with Julian’s choice to include you among the best this month. 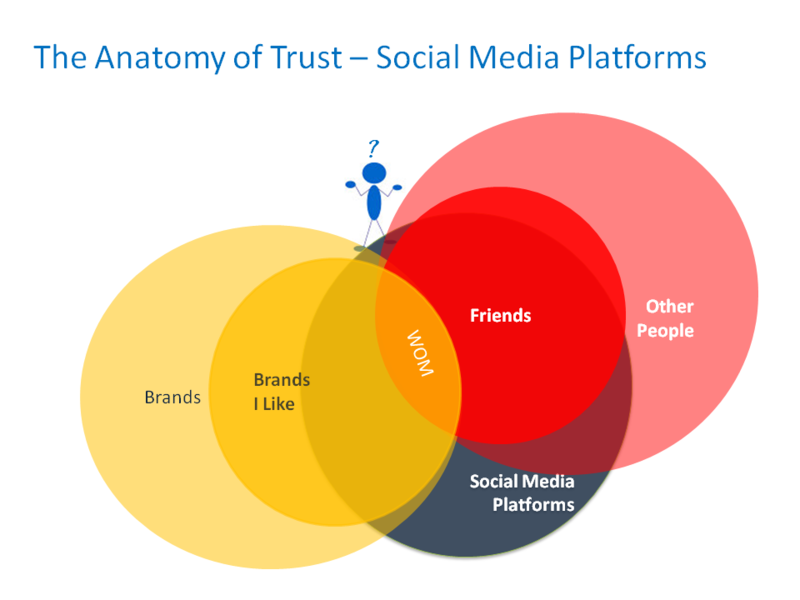 Your “Anatomy of Trust in Social Media” is great, interesting and truly shines a bit on how we are still adjusting to social media and placing a strong requirement of trust into what we do with it.